NAMIC participated in the TCT Asia 2018 as part of its AM industry internationalization efforts. This is a premium regional 3D printing event and a platform for the start-up companies to showcase their products and services. It is also a great opportunity to meet and network with companies and adjacent industries with interests in the fast-growing 3D printing market. 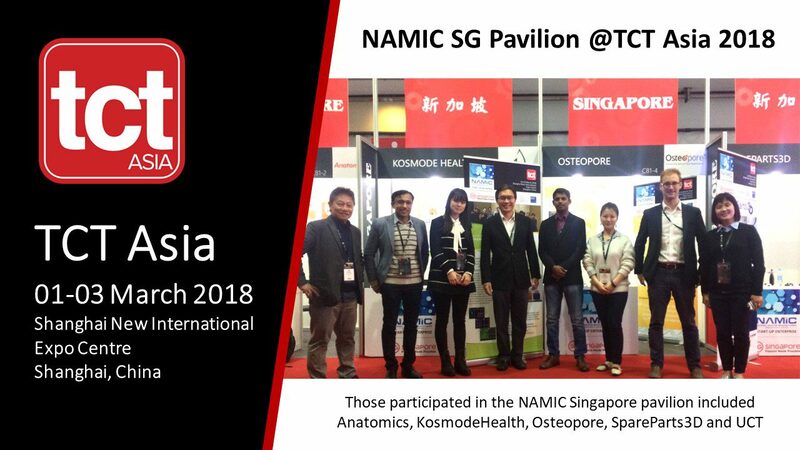 Those participated in the NAMIC Singapore pavilion included: Anatomics, KosmodeHealth, Osteopore, SpareParts3D and UCT. TCT Asia 2018 was held from 1-3 March 2018 at the Shanghai New International Expo Centre in Shanghai, China.